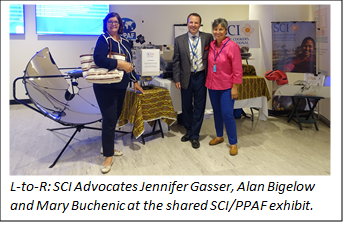 Written by SCI Science Director and Main Representative of SCI to the UN Alan Bigelow, Ph.D.
SCI and partner Public-Private Alliance Foundation (PPAF) Executive Director Dr. David Stillman applied for, and were granted, a shared exhibition space for HLPF 2018. 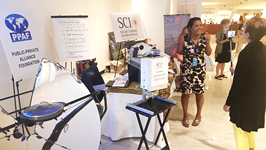 The SCI/PPAF exhibition displayed four solar cookers, a test station for SCI’s Performance Evaluation Process (PEP) and showcased the SCI/PPAF partnership efforts in Haiti for clean, sustainable solar cooking solutions. Thanks to SCI volunteers Mary Buchenic, Jennifer Gasser, Jannis Buerger, Ernestina Williams, Peter Gallett, and youth volunteer Arun Raman who joined the SCI advocacy team for this event, our exhibition space was able to greet – and discuss solar cooking with – a steady stream of visitors during the eight-day forum. 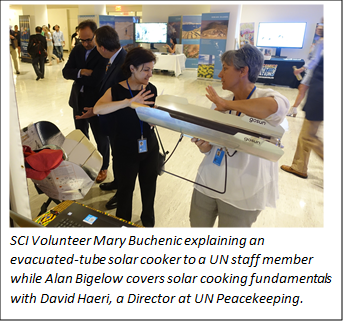 SCI’s advocacy team was interviewed by UN News and other organizations, which helped amplify the messaging about the many benefits of solar cooking and the importance of SCI testing solar cookers according to ISO standards. 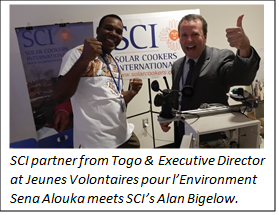 We were eager to spread the news that ISO 19867-1 guidelines for laboratory tests of clean cookstoves were published in June 2018. 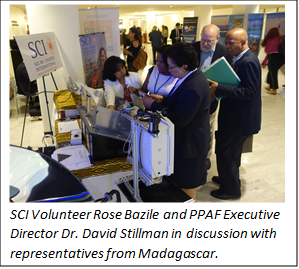 Highlights from HLPF 2018 were certainly the hundreds of in-person connections and discussions. Here is a sample list of people we were thrilled to meet with and discuss partnerships for the global solar cooking movement: SCI partner from Togo & Executive Director at Jeunes Volontaires pour l’Environment Sena Alouka; SCI’s first UN representative Roma Stibravy; Global Alliance for Clean Cookstoves new CEO Dymphna van der Lans; International Solar Alliance (ISA) Interim Director General Upendra Tripathy and ISA Program Ambassador Mohua Mukherjee; Permanent Mission of Burkina Faso to the UN Second Counselor Honorine Bonkoungou; UN Department of Peacekeeping Operations & Department of Field Support Director David Haeri (who I hadn’t seen since we were in high school); and Anna Lisa Jose at the United Nations Development Programme (UNDP). In many ways, these in-person meetings marked the beginning of important follow-up work to come.